Cake-meister Tammie Coe was among the first people in the valley to lay a winning bet on this five-block stretch of downtown. Now her soulful, playful bakery/cafe, Tammie Coe Cakes--with two Phoenix outlets--is still going strong. Coe ended her long-standing relationship with popular restaurant La Grande Orange in fall 2012, but you can find her artful brioches, cupcakes, and cookies by going directly to the source. Her red velvet cupcakes, insanely moist concoctions topped with addictive cream cheese icing, are Roosevelt jet fuel. Cake-meister Tammie Coe was among the first people in the valley to lay a winning bet on this five-block stretch of downtown. 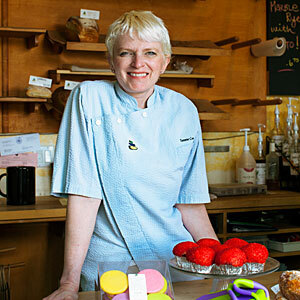 Now her soulful, playful bakery/cafe, Tammie Coe Cakes–with two Phoenix outlets–is still going strong. Coe ended her long-standing relationship with popular restaurant La Grande Orange in fall 2012, but you can find her artful brioches, cupcakes, and cookies by going directly to the source. Her red velvet cupcakes, insanely moist concoctions topped with addictive cream cheese icing, are Roosevelt jet fuel.